Kitsap area teens in grades 7-12 in are invited to read/recite/perform an original poem, short story, scene from a novel, monologue, scene for up-to-four players, or song. The rules are few and simple: 5 minutes in length, original compositions only, PG content. Every level, genre and category is welcome. Prizes will be given to all participants! Registration is not required to participate. Bring your family, friends, and neighbors to cheer the readers on! 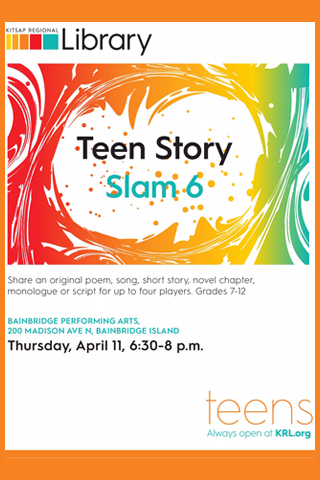 Teen Story Slam 6 is a FREE event, sponsored by Bainbridge Public Library. Donations are welcome at the door and will help support BPL’s Teen Writers Workshop and Teen Creative Writing Summer Camp, which are both free to students in grades 7-12. Students are also welcome to attend BPL’s Teen Writers Workshop on the second Thursday of every month (4:00 – 5:30 p.m.) for writing prompts, writing time, and help with editing and polishing their poetry and prose. Donations are welcome at the door and will help support Bainbridge Public Library’s Teen Writers Workshop and Teen Creative Writing Summer Camp, which are both free to students in grades 7-12.